Do British GTC Cars Have A Future In 2007? The FIA GT Newsletter which was released last Sunday evening (ironically just after the British GT Championship Cup Class [GTC] runners had been racing around Pau) included an interview with SRO’s Stephane Ratel. The interview largely related to the European FIA GT3 Championship, which got off to such an exciting start at Silverstone early last month. But there were also comments in connection with the future of the Avon Tyres British GT Championship – comments which the teams were incapable of absorbing earlier this week, but which have brought forth some fairly firm reactions since. As a Morgan man through and through, there’s the simple matter of that company not producing a GT3 car – plus the obvious fact that his current car becomes ineligible for the domestic series at the end of this season, if the championship becomes GT3 only. Andrew Howard is the entrant of the Beechdean Ferrari 360 – a newcomer to British GTs this year, the team having moved from Britcar at the end of last season. “This is not unexpected,” says Andrew Howard. “But I feel that a desire to lose the GTC level of racing in the British GT Championship will signify the end of large grids. RPM’s Robin Mortimer was at least as outspoken as Beechdean’s team owner. “It’s disturbing that no one from SRO has bothered to consult the entrants to see what they think,” begins Robin Mortimer. “I already own GT3 cars (as well as GTC cars), and although I think the concept (of GT3 only) is correct, the implementation is too soon. Cutting off GTC at the end of this year is completely impractical. The other issue is that of the GT2 class – which would also, according to Stephane Ratel’s proposal, be wound up at the end of this year. GT2 numbers are currently hovering around the minimum number required for full points to be scored (six), and the class is heading towards a championship showdown, on current form, between Scuderia Ecosse and Team LNT. Every entrant’s position is slightly different – Scuderia Ecosse with its international ambitions, Team LNT as agent for the Panoz marque in Europe, and Eclipse entering a car, the Mosler, that isn’t currently homologated for some international events, for example – but GT2 numbers do suggest a problem with this class for 2007. 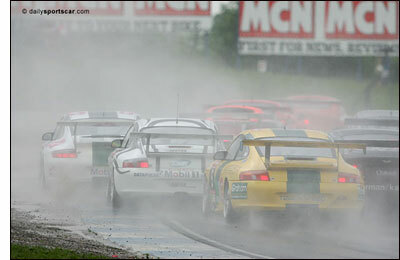 GTC has been thriving in comparison, and has been the core of the 2006 Avon Tyres British GT Championship. Will the Cup cars race in the championship in 2007, or will they become a four-year component of British GTs, with no chance of a fifth? Yes, they will race next year - see next news item for a hasty change of plan for the Cup cars in 2007.